The LEGO Robotics Club is offered a part of the ASAP after-school program for Gettysburg elementary schools. 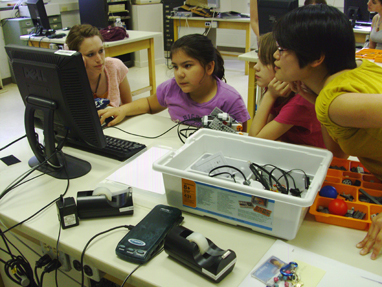 The 6-week program provides 4th and 5th grade girls the opportunity to explore computers and robotics technology in a nurturing, girls-only environment under the guidance of Gettysburg College students. Research suggests that programs like this are effective tools to challenge the gender divide of men and women in high paying, technology-oriented careers. Check with your child’s teacher to register your child for the Fall or Spring sessions of LEGOs. In 2011, Gettysburg High School student Kasey Rathgeber started a LEGOs program at Gettysburg Middle School to bridge the gap between our elementary school program and STEM Savvy at Gettysburg High School. Find out how you can support LEGOs and our other women’s empowerment programs. 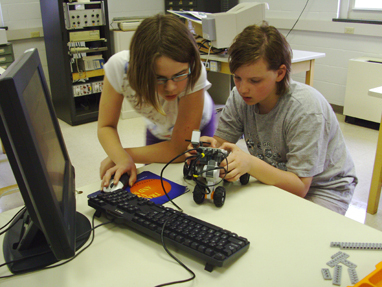 Fourth and 5th grade girls at Lincoln Elementary School work with Gettysburg College students to build and program robots during the Spring 2010 LEGO program.